The spear is the favorite weapon of the Arab, the saying goes. It was the prime weapon used to establish the first Caliphate and secure the Ummah. Easy to summon from Bedouin as well as city-dwelling Arabs, their role is a simple one yet one well realized to be essential. 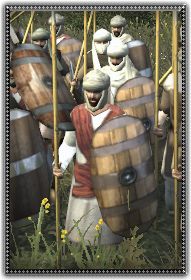 These lightly clad spearmen, hardened by the unrelenting sun and the desert sands are a hardy force that can stand their ground without fear, that is, if you can keep their spirits up. Reliable Light Spearmen with strong shield, capable in defense against light and medium foes.